Where are the rock strata boundaries? Where is this borehole making water? Why isn’t my explosives column rising? I wish I could see into this borehole! The StrataCam™ Borehole Camera is MREL’s latest addition to the Blasting Instrumentation Product Line. It is used to clearly view and accurately record the physical location of geological strata, weak/strong boundaries, ore/waste boundaries, coal seams, top of coal, free-surface of water or ingress points, in-situ fractures, cavities, and irregularities. This information is quite valuable to a blaster who needs to modify the loading pattern. 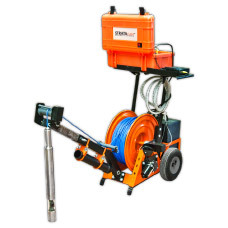 The StrataCam™ is a modern, compact, self contained video logging system that allows a single user to inspect and record many boreholes quickly and efficiently. Perform high resolution video surveys of dry or water filled boreholes with diameters as small as 63.5 mm (2.5 in.) and to a maximum depth of 300 m 1000 ft.). The StrataCam™ Borehole Camera components are watertight to external pressures of 3.4 MPa (500 psi).